How often do you do them? Any specific oils and filters anyone prefers? I did my first tune at the 500 mark which included oil change but reaching 3k right now. Wondering if I should do one. I do my car every 3k but I feel like maybe this baby should be done more often. I have 10200 km on clock and oil(Motul 300v) still has nice color(pink has turned very light brown). All gears sift nice, clutch works ok, so i don't change it before this year end or 16k km service. For oil, i will try Castor Power 1 Racing as Triumph suggests. Currently finding neutral is hard(will jump over), will see if this makes any difference. The service manual states the oil should be changed once per year or every 10,000 miles. I’m also at the 3,000 mile mark. Under normal road riding conditions a synthetic oil will not have any issues at all between its yearly service. 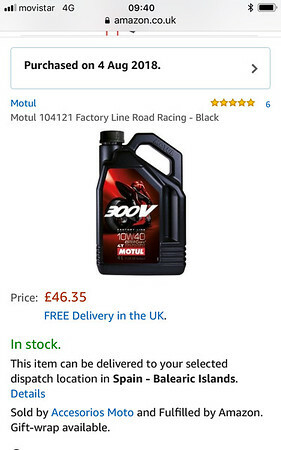 I also use Motul 300V. Had Power 1 in my GSA and changed it to 300V THE SECOND the warranty period expired. I really did not like that horrible oil and despised every KM with it. The engine was SO much noiser and gear changes clunky. 300v sorted all those problems out on the Beemer. The bmw mechanic now also uses 300v in his bike after riding & hearing mine. I just ordered 4L from amazon UK for my next change. I usually have my oils changed before the recommended interval. Some may state overkill, but I really don’t care. I also never ran my engine in (rode it like i should from day 1, but ALWAYS with good time for it to warm up) and it runs sweet. Last edited by eisen77; 08-09-2018 at 03:44 AM. I’m kinda of with you to be honest... personally 5,000 miles is where I plan to carry out an oil change, which I’ll reach long before the next service interval next year. 10,000 miles just seems to be a little too much and given that oil is very cheap in comparison to a new engine... it just helps me to sleep a little better! Forjox, eisen77, Rocky and 1 others like this. 10,000 miles is a long time. I'm at 5,300+ right now , and will be servicing it soon. I plan on 5,000 mile oil changes on her. So , counting my break in change (500) , I'm due. After nearly loosing a motor in my Tiger (which called for 6,000 mile changes) , I cut it to 3,000 and was happy with that. Yes , I know I'm wasting good oil , but I'm Ok with that. eisen77, Mike J Commo, Taurus and 1 others like this. eisen77 and Big Bear like this. I don't think it is wasting oil. Modern oil will lubricate for galactic mileages but it loses its detergent properties much earlier. I've always changed my car engine oil every 5k and bikes every 2k. At 100k my last car was due for replacement timing chains. The guy who did it photographed the interior of the engine to show apprentices what frequent oil changes did for an engine. He said the interior of the engine was in a factory fresh condition with no signs of deposits or restrictions of oil flow. He regularly sees engines that have stuck to the manufacturer's service schedule show signs of impeded oil flow by under 30k. A friend was the workshop manager for a Vauxhall dealership when they offered 100k warranties. The number of engines they had to replace by 50-60k because people had stuck to the 10k oil change routine was scary. Interestingly Vauxhall scrapped that warranty - I reckon it was costing them too much in replacement engines. With a more limited warranty they get beyond it before major problems show. I always do my cars every 3k and I’ve had two cars now running perfectly one up to 200k and this one I’m up to 125k.